Big boho hats and beach waves are all the craze this summer, yet again. We love that wide-rimmed hats are extremely flattering on every trendy chick and that natural looking beach waves are easy to master in just a few minutes. Whether your wide-brimmed accessory is shielding you from the sun or just adding an extra fun element to your outfit, we can’t get enough. To put a unique twist on this classic summer look, add a shimmery eyeshadow to the entire lid, which is a fun way to brighten up your eyes. To achieve this trendy summer look, check out our tips below! 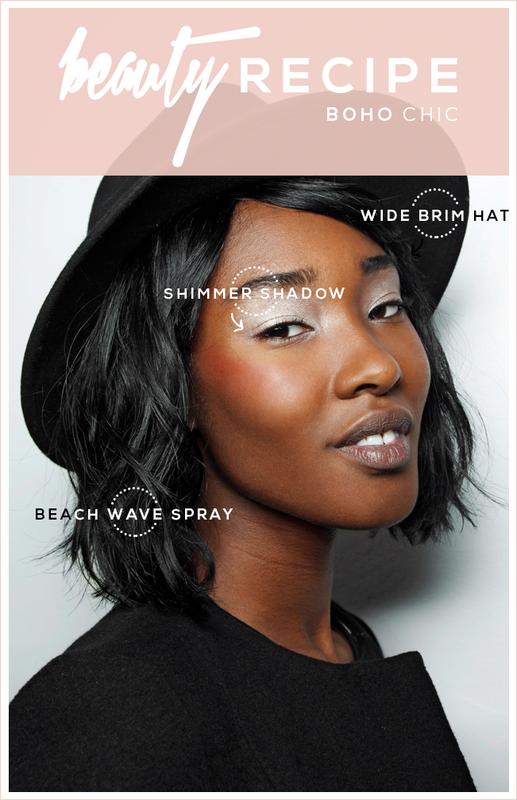 Shimmery Shadow: Have fun when choosing a shimmery eyeshadow. Whether matching your shadow with your outfit or going neutral with silver, apply shadow to the entire lid. A silver will brighten your eyes while a dark shimmer is perfect for a night out. Sea Salt Hairspray: When finished curling hair with a mid-size curler, spritz a small amount of sea salt hairspray throughout your hair. This will give your hair texture to ensure that waves last all day. Remember to comb through hair with your fingers when finished to give you the natural beach waves you’re looking for. Boho Chic Hat: Top this summer look off with a wide-brimmed hat. Whatever color you choose, you can’t go wrong.